Gather friends and colleagues together for a great adventure. Whoosh Explore Paddling parties are a great way to get out as a group, we offer sessions for Adults and Families looking for a special event. Whether it is a birthday party with a difference or a group paddle from work, or a youth group looking for a new challenge we can organise a paddling event for you. Take part in fun sessions, team building or enjoy an evening paddle with sessions available throughout the summer. Paddle over a weekend with family and friends on the River Stort. we have several great places to paddle on the river starting from Sawbridgeworth towards Bishops Stortford, Harlow to Nazeing or from Broxbourne to Paddington Basin ! There are plenty of friendly hotels, camp sites and youth hostels along the way to choose from. 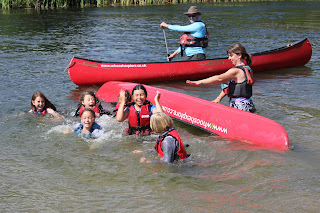 We offer kids parties on a Saturday or Sunday morning or afternoon and can offer paddling sessions for groups of upto 25 children in canoes and kayaks. The recommended youngest age from a paddling party is 9 years old as groups of younger paddlers often find it difficult to paddle in some weather conditions. We have plenty of space for party games and parking and the field area can be used for a picnic. For younger groups we like to have some parents willing to assist with moving boats and they are welcome to join in with paddling particularly if we have a young group on the water (ages 9- 10) to assist in paddling on the river or lake in windy weather. Older groups also enjoy an afternoon of paddling with a group of mates on the river. With a teenage group they can paddle on their own adventure with a coach at hand to help get them started and we support the groups getting round locks and features on the river. Evening paddling sessions on the River Lee from £12.50 per person. Trips from Stortford available to groups. We can also can catering on site for Barbeques on request and have access to a Lakeside Marquee suitable for conferences and corporate hospitality at Redricks lakes.